Did you know that 90% of people who smoke start before the age of 18? Studies show that because the teen brain is still developing, youth are more vulnerable to nicotine addiction. Tobacco companies know this, and have a long history of targeting youth to get a new generation of people hooked on their deadly products. According to the U.S. 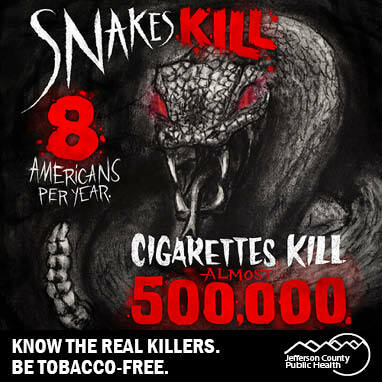 Surgeon General, tobacco use remains the leading cause of preventable death and disease in the United States and world. In the U.S. alone, cigarette smoking causes almost 500,000 deaths each year. 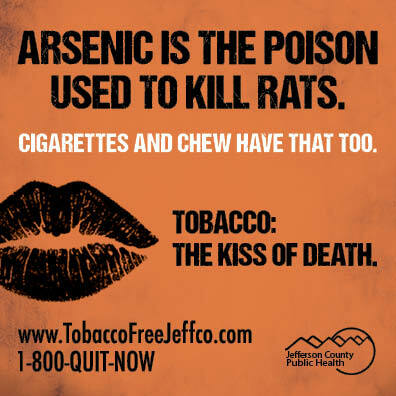 There are a variety of ways youth can get involved in ending the tobacco epidemic and helping Jeffco be tobacco-free! Talk to a parent/guardian, doctor, school counselor or other trusted adult to learn about ways to never start tobacco or, if you use tobacco, how to quit today. Quitting isn’t easy, but it can be done and the health benefits of quitting start as quickly as 20 minutes after your last cigarette. There are several helpful, free resources that are designed for teens who are ready to quit tobacco. Many schools offer a Not-On-Tobacco (N-O-T) group to help students quit tobacco. N-O-T is a 10 week, voluntary quit smoking program for teens ages 14-19 that helps teens identify healthy alternatives to tobacco use. Participants report the program helps them in areas of their lives beyond tobacco use. Ask your school’s counseling office if there is a N-O-T group at your school. For more information about the N-O-T program, visit the American Lung Association’s Not On Tobacco Page. For telephone support, coaching and resources to help you become tobacco-free, call the Colorado QuitLine at 1-800-QUIT-NOW or visit COQuitLine.org. If you prefer to receive text messages, Smoke-Free Teen is a great resource to help in your quitting journey. Visit Teen.SmokeFree.gov to sign up for 24/7 text message support for quitting tobacco. Download the Quit and Save App to your smartphone for additional help with quitting tobacco. Find out more about the tobacco industry’s dirty secrets and how to build a resolve to quit and stay quit. This includes games, videos and other fun youth-focused resources encouraging tobacco-free living: TheTruth.com. Don’t let tobacco control you. Learn about the Real Cost of tobacco here: TheRealCost.BeTobaccoFree.hhs.gov/. Get help to quit by using Colorado’s web-based resources at: TobaccoFreeCO.org. Quit chew, dip or other forms of smokeless tobacco by visiting: MyLastDip.com and ChewFree.com. Find helpful fact sheets and information on Campaign for Tobacco-Free Kids. 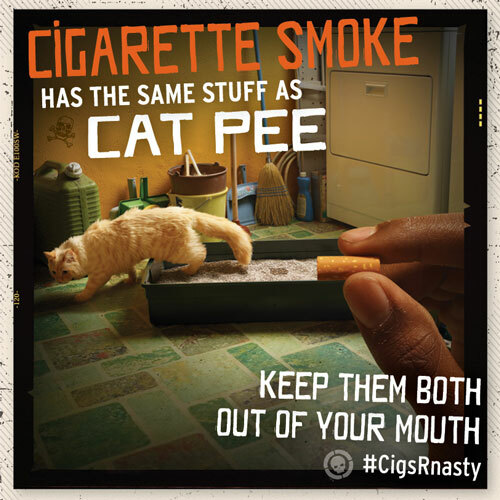 For information on the health impacts of tobacco, tobacco industry tricks, what’s in smoke and more, visit: TobaccoIsNasty.com. Learn the truth about electronic smoking devices here: TobaccoFreeJeffco.com/Vaporizers/. Play the Zombie Smokeout Game for a fun way to keep your hands busy until the urge to smoke or use other forms of tobacco passes. 1. U.S. Department of Health and Human Services. Preventing Tobacco Use Among Youth and Young Adults: A Report of the Surgeon General. Atlanta: U.S. Department of Health and Human Services, Centers for Disease Control and Prevention, National Center for Chronic Disease Prevention and Health Promotion, Office on Smoking and Health, 2012 [accessed 2015 May 20]. 2. U.S. Department of Health and Human Services. The Health Consequences of Smoking—50 Years of Progress: A Report of the Surgeon General. Atlanta: U.S. Department of Health and Human Services, Centers for Disease Control and Prevention, National Center for Chronic Disease Prevention and Health Promotion, Office on Smoking and Health, 2014 [accessed 2015 May 20]. 3. Centers for Disease Control and Prevention. Chemicals in Tobacco Smoke: www.cdc.gov/tobacco/data_statistics/sgr/2010/consumer_booklet/chemicals_smoke/. 4. Centers for Disease Control and Prevention. Tobacco Industry Marketing: www.cdc.gov/tobacco/data_statistics/fact_sheets/tobacco_industry/marketing/.